This post is a tentative quick start guide for Myxa motor controllers. It assumes that the user has a GNU/Linux enabled PC; support for Windows is going to be added pretty soon as well. 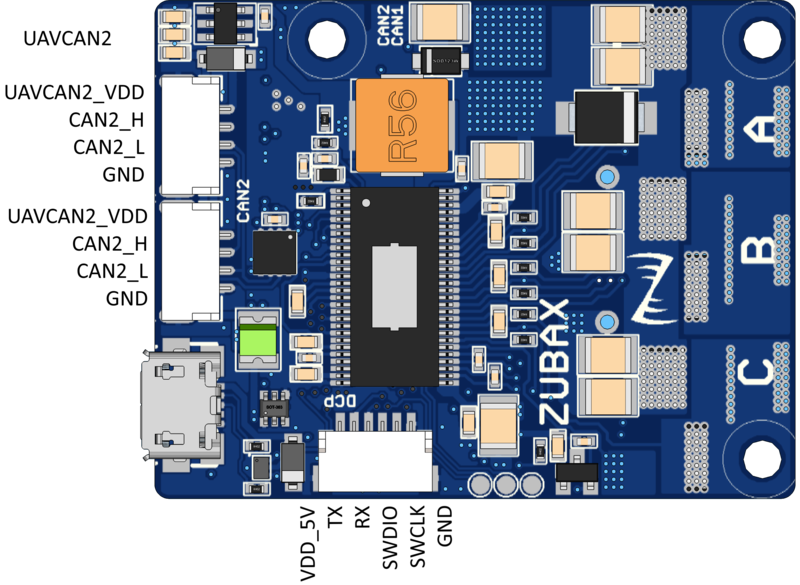 If you have any questions or concerns, please send us an email to info@zubax.com, or post right here in the comments. The user is advised to have a basic understanding of the field-oriented motor control theory. Download the Kucher GUI tool. Connect the motor to Myxa (if you need to reverse the direction of rotation later, swap any two phases). The motor should be disconnected from any mechanical load (propellers, thrusters, gearboxes, etc), otherwise, the automatic motor identification procedure may return suboptimal results. You must not touch the motor while identification is in progress for the same reason. Connect Myxa to a power supply, and then to your PC via USB. Launch Kucher, specify the number of poles and the rated current of the motor. Launch the motor ID procedure. What motors does the Myxa support without customization? Any chances kucher will work under Mac OSX? Switching from Orel 20 to Myxa, is my Motor no longer compatible? Okay, continuing with the quick start guide here. Voltage control mode – in this mode, the controller modulates the specified quadrature axis voltage Uq, ignoring the quadrature axis current Iq, while maintaining the direct axis current Id close to zero. This mode imitates the behavior of a typical BLDC ESC. Current (torque) control mode – in this mode, the controller modulates the specified quadrature axis current Iq, while maintaining the direct axis current Id close to zero. Since the torque of an electric motor is linearly dependent on the magnitude of the torque-generating current (i.e. the quadrature axis current Iq), this mode allows the controller to achieve constant torque irrespective of the angular velocity of the rotor (until the voltage modulator is saturated). This, in turn, can be used to modulate a nearly-constant thrust if the controller is used to drive a propeller or some other thruster. Velocity control mode – in this mode, the controller runs an angular velocity control loop (which is based on a simple PI controller) on top of the current control loop described earlier. The controller maintains the requested velocity by regulating the torque. This control mode is typically used for variable pitch drives or multirotor UAV drives. This control mode is selected by default. Some theory on motor control in the context of simple BLDC drives can be found in the Sapog Reference Manual. 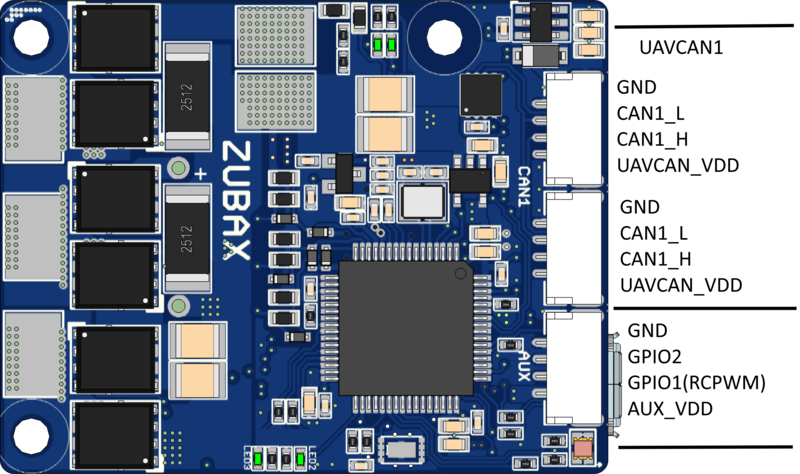 Single or doubly-redundant CAN bus – UAVCAN. The UAVCAN GUI Tool might come in handy. The implementation of UAVCAN in Myxa is largely equivalent to that in Sapog, so please refer to the Sapog Reference Manual for an in-depth description. The only major difference is that Myxa does not support automated ESC index assignment - it has to be configured manually. Proprietary binary serial protocol over USB and UART. The protocol is built on top of Popcop; it features a strong data integrity protection and resilience to packet losses. This protocol is leveraged by the Kucher GUI tool; as Kucher is open source, you are encouraged to use it as an example and reference for building your own applications that interact with Myxa. The industry-standard RCPWM, sometimes referred to as RC PWM or even RC PPM. This interface is flawed in many ways, so we generally discourage its use. 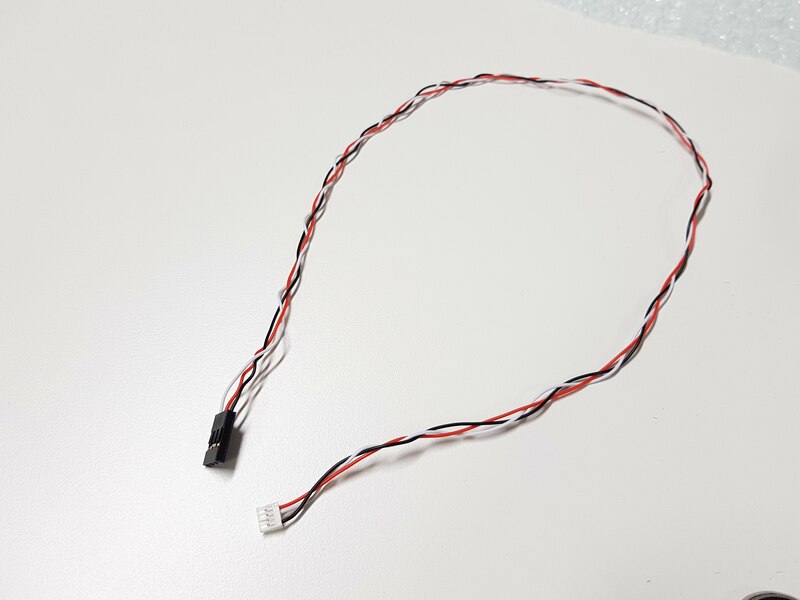 Shall you choose to use it, you will need an adapter cable (shown below) that connects the pin GPIO1 of the Aux connector on Myxa to an RCPWM-compatible header as shown below. 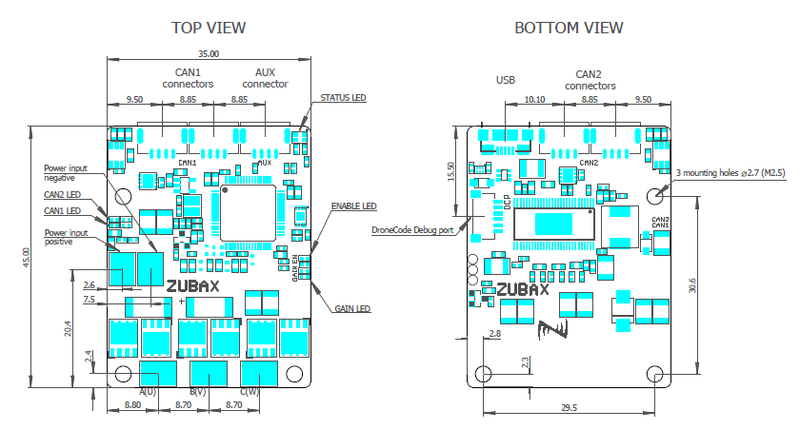 Integration instructions for Myxa are not yet written; however, we have them for Sapog, and seeing as Myxa’s communication interfaces are largely similar to those in Sapog, we suggest our early customers to refer to the following guides, keeping in mind the differences in configuration parameters, which we’re going to review here next: https://kb.zubax.com/x/cYAh. In this section, we’re going to walk through some of the most important configuration parameters available in Myxa. Most configuration parameters take effect virtually immediately or at the next use, so in most cases, it is not necessary to restart Myxa. eangvel - electrical angular velocity; always in electrical radian/second. 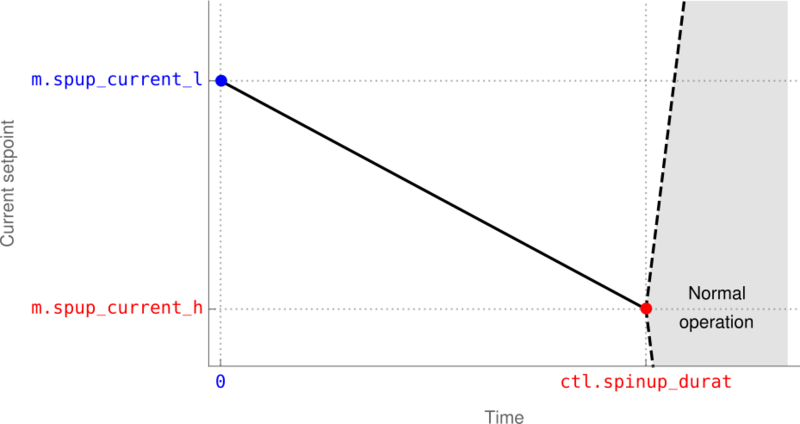 ttl - time-to-live - the amount of time between the last command received from the given interface until the motor is stopped automatically. Motor control parameters are contained in the section m; for example, m.max_current. Some of the parameters in this section are deduced by Myxa automatically if they are not provided by the user. It is, therefore, necessary to reset all of the parameters in the group if you’re switching Myxa to a different motor; otherwise, the auto-deduced parameters will keep their old values. All parameters in this group take effect when the motor is started or re-started. Restarting the whole device is not necessary. m.num_poles - the number of magnetic poles on the rotor; equals the number of magnets on the rotor; always an even number. m.max_current - rated phase current of the motor, in amperes (more on this later). m.min_current - minimum current at which sufficiently stable operation of the drive is guaranteed. Deduced automatically from the previous parameter; can be changed by the user if necessary. You should lower this value if your application requires low-speed operation. m.flux_linkage - magnetic flux linkage in weber; measured automatically. m.resistance - phase resistance in ohm; measured automatically. m.induct_direct - direct axis phase inductance in henry; measured automatically. m.induct_quad - quadrature axis phase inductance in henry; measured automatically. m.min_eangvel - minimum electrical angular velocity, in electrical radian/second, at which sufficiently stable operation of the drive is guaranteed. You should lower this value if your application requires low-speed operation. m.max_eangvel - maximum rated electrical angular velocity, in electrical radian/second. Raise this value if the motor does not reach required speed levels in the RPM control mode. m.current_ramp - the maximum rate of change of the quadrature current setpoint (Iq), in amperes per second. m.voltage_ramp - the maximum rate of change of the quadrature voltage setpoint (Uq), in volts per second. Generally, values above 10 V/s require a higher setting of m.current_ctl_bw, otherwise the stability can be compromised. m.eangvel_accel - the maximum permitted acceleration, in electrical radian per second per second. It is likely that this value will need to be increased for multirotor drives. m.eangvel_decel - the maximum permitted deceleration, in electrical radian per second per second. It is likely that this value will need to be increased for multirotor drives. Do not exceed 10000 radian/second^2. m.eangvel_ctl_kp - P gain of the RPM PID controller. Units: ampere*second/electrical_radian. m.eangvel_ctl_ki - I gain of the RPM PID controller. Units: ampere/electrical_radian. m.eangvel_ctl_kd - D gain of the RPM PID controller. Units: ampere*second^2/electrical_radian. 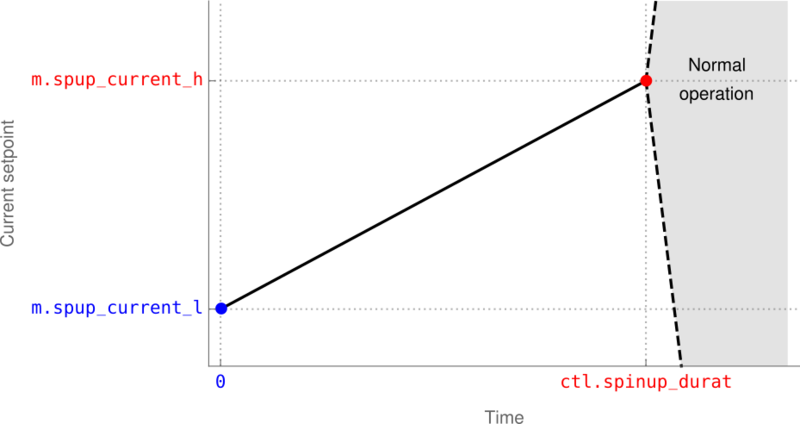 m.current_ctl_bw - the bandwidth multiplier of the current control loop; unitless. At very high ramp settings, especially in the voltage control mode, this parameter should be increased in steps of 0.02. Generally, values up to 0.1 are safe. There is only one parameter in this group; it is valid only for Myxa B: bec.can_pwr_on. It defines whether the BEC (battery elimination circuit) power output is enabled or not. The parameters takes effect immediately. All parameters in this group take effect after a reboot. uavcan.node_id - the UAVCAN node ID. If set to zero, which is the default, Myxa will attempt dynamic node ID allocation. uavcan.esc_index - the index of this ESC on the vehicle. Set to zero by default; must be configured manually. uavcan.esc_ttl - deadman switch timeout, in seconds. Beware that Myxa does not support automated ESC index assignment. The parameter uavcan.esc_index must be configured manually. All parameters in this group take effect when the RCPWM signal is connected, i.e. in order to apply new parameters, disconnect the RCPWM cable from the device and then connect it back at least 0.1 seconds later. An exception is rcpwm.enable - out of safety considerations, this parameter takes effect only after reboot. The basics of RCPWM are explained in the relevant section of the Sapog reference manual, and some useful information is also provided on Wikipedia. rcpwm.enable - whether to enable the RCPWM interface. Requires reboot. rcpwm.pulse.bot - minimum duration of the RCPWM pulse, in seconds. rcpwm.pulse.mid - duration of the RCPWM pulse that is treated as a zero setpoint, in seconds; i.e. the motor will be stopped. rcpwm.pulse.top - the maximum duration of the RCPWM pulse, in seconds. rcpwm.ttl - deadman switch timeout, in seconds. Which implies that the motor will be stopped when the pulse is 1.5 ms long; run forward if the pulse is longer than that, and reversed if the pulse is shorter than that. In order to configure unidirectional operation, set rcpwm.pulse.mid to 1 ms. In certain scenarios, with some motors, manual tuning of the control system may be required in order to achieve optimal performance. 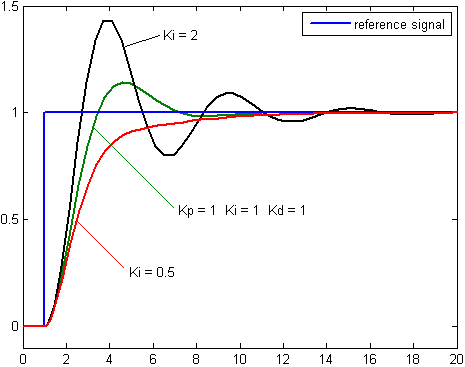 1.2. decrease observer parameters towards o.ekf.q_id = 10000 and o.ekf.q_iq = 30000 until a stable and smooth operation in all range of current setpoints is achieved. 2.2 if the previous operation didn’t help, decrease the parameters m.voltage_ramp and m.current_ctl_bw. If you need to improve the step response characteristic in the voltage control mode, increase the parameters m.voltage_ramp up to 50 V/s and m.current_ctl_bw up to 0.1 in small steps. If you need to tune Telega in the speed control mode, first of all, set the maximum speed for your application. Apply the minimal battery voltage to the ESC. Spin the motor up to maximum speed by sending a 100% setpoint in the Ratiometric Voltage Control mode or Ratiometric Current Control mode. Read the value of the parameter motor.electrical_angular_velocity and assign this value to the parameter m.max_eangvel. This change will ensure that the speed controller will never reach saturation in your application and the speed will be always controllable. After that, you should tune the speed controller as described. Is it recommended to perform the motor identification for every motor, or can the parameters be reused for motors of the same type? Assuming the motor manufacturer has reasonably good quality control. Some decent motors may not require identification at all (e.g. Maxon, Anaheim), you can just copy-paste the motor parameters from the datasheet provided by the vendor. Low-cost motors and motors with poor repeatability (e.g. T-Motor, Tarot, KDE, Scorpion, and so on) always require identification for every motor. UPDATE: Regardless of the information provided in this post and earlier, we recommend using the Voltage control mode in applications where fast response is required (such as multirotors). In the voltage control mode, the response dynamics is governed by the parameter m.voltage_ramp (in volt/second). At high ramp settings, the parameter m.current_ctl_bw will have to be increased as well in steps of 0.02 in order to keep the drive stable during rapid speed changes. This recommendation might change when the firmware v0.2 is released. By default, Myxa’s control loops use fairly conservative settings which result in slow speed response characteristics. These settings are optimized for applications where fast response is not required by design (e.g. electric aircraft and submarines). Other applications, such as multirotor aircraft, may require faster step response, in which case Myxa’s settings will require adjustments. Set the acceleration rate to 10 000 ~ 15 000 electrical radian per second per second, depending on the needs of your application. Set the deceleration rate close to 10 000 electrical radian per second per second or lower (higher values should be avoided). Set the maximum current to 1.5 times of the maximum continuous current of the motor, but not higher than 40 A. Increase the P gain of the speed controller (more info below). Increase the I gain of the speed controller (more info below). P - number of rotor poles. The standard PID tuning principles apply. Generally, the proportional gain should be increased until a satisfactory short-term performance of the controller is achieved. After that, the integral gain should be increased until the convergence is satisfactory yet the system doesn’t trigger self-induced oscillations. 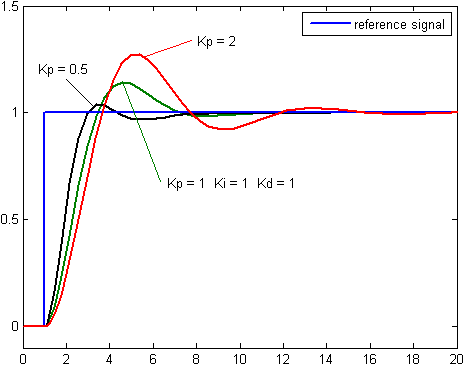 The response of a generic PID controller to Kp and Ki is shown on the images below, respectively. Starting the motor from standstill is challenging for any sensorless drive, Myxa is no exception. Myxa will abandon spinup and restart from scratch if the motor did not reach stable operation by the end of the ramp. Observe also that if the motor is already spinning when the ramp is activated, Myxa will detect that, and skip the ramp, switching to the normal operating mode immediately. This behavior ensures that the motor can be restarted quickly and reliably if the rotor is already spinning in the correct direction. However, high settings of the initial current setpoint can somewhat interfere with this behavior. The proposed configuration defines a reverse (negative) current ramp. If the motor overshoots to a high speed after spinup and it is considered unacceptable, the initial current value m.spup_curr_begn can be reduced as necessary. Usage of constant current ramps (i.e., when the endpoints are equal) is likely to lead to substandard performance and therefore not recommended, because the rotor state observer requires some current gradient in order to deduce the initial position of the rotor. A popular source of confusion when using Telega (or vector control drives in general) is the complicated relationship between the DC link current (the current that flows between the battery and the motor controller) and the phase current (between the controller and the motor). Reviewing the system in terms of power conversions helps to eliminate the confusion. The reactive power is not of interest in this case, so it can be ignored safely. Notice the similarity with the above equations. The windows version of Kucher is missing from your FTP server. The Windows version has not yet been released, sorry. We’re going to post an announcement here when it is available. I have a step model for Myxa B. I will just leave it here. Rejoice, Telega v0.2 is available! Download the binary from the file server. The firmware can be updated via CAN using the UAVCAN GUI Tool. Improved stability, especially during rapid acceleration and deceleration. Field weakening (flux weakening); please contact us for setup instructions – official documentation will be released later. Fixed the power-up issue where the device would refuse to boot unless the power supply voltage slope is steep enough. RPM control loop stability improvements. Faster boot-up – approx. 200 milliseconds from power on to ready to run. Faster and more robust spin-up process. Motor self-test at power-up is not performed by default; can be enabled via ctl.pwron_slftst. Selectable spool-down policy: either controlled braking (default) or immediate power stage deactivation (set ctl.hard_stop). The quick-start entries above have been updated to match v0.2. If you still care about v0.1, use the edit history to reach the outdated entries. Proper documentation will be available with Mitochondrik, stay tuned. We are hideously behind the schedule, but there are good reasons for that – testing takes time, and certain complex features (such as flux weakening) require a lot of effort to implement and validate. Our current focus is stabilization and documentation. On a related note, Telega v1.0 will be equipped with UAVCAN v1.0; read more here: https://forum.uavcan.org/t/stockholm-summit-recap/170. Any updates on Windows version? I see posts from early 2018 saying it will be available soon, but I don’t see it in the file directory. Still nothing so far. Will post when available.